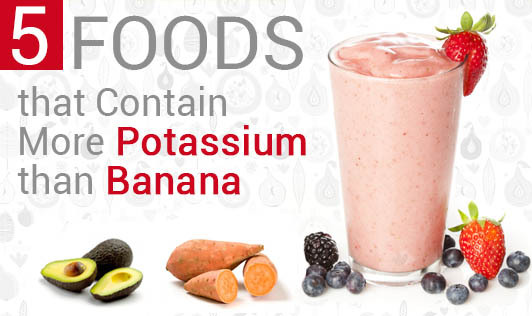 Banana isn't the only food packed with powerful potassium. Potassium is an essential nutrient, important for muscle strength, nerve function, and maintaining heart health. If you fail to meet your daily requirements of 4,700 mg of potassium per day, it could lead to deficiency causing fatigue, muscle cramps, palpitation, and dizziness. You have most probably heard that bananas are packed with potassium, which is a fact. This tasty fruit provides you with ample amounts of the nutrient. A medium-sized banana gives around 422 mg of potassium and is certainly a good way to stock up your requirement. However, it is definitely not the only way to load up on this essential mineral. Here is a list of 5 foods that have more potassium than a banana. Have a sweet potato as a side dish with your meal or just gobble it down as a snack. A medium-sized sweet potato will give you about 542 mg of potassium. This vitamin-packed delicious food is definitely a superb source of potassium too. There are a million different ways to include Popeye’s favorite vegetable in your diet and reap the benefit of its massive 839 mg potassium content per cup. White beans also known as ’Sem Phali’ in Hindi and ‘Pavta’ in Marathi can be included in gravies or can be added to soup and salads. These beans are loaded with potassium. Just half a cup of beans will give you around 502 mg of potassium. Want to snack healthy? Just add the simple yogurt to your diet. A standard single serving of yogurt will provide you with approximately 579 mg of potassium.